UNITYLEDtm post-mount spotlights are the only auxiliary lighting products that offer the convenience and safety of instant aimable light when and where you want it! The interior control handle with fingertip switch provides 360 degree continous horizontal rotation and up to 120 degree vertical adjustment. The 335 series post-mount spotlights feature a 6" LED PAR 46 lamp rated at 215,000 candlepower, 12 volts, 30 watts and 50,000 hours lamp life. 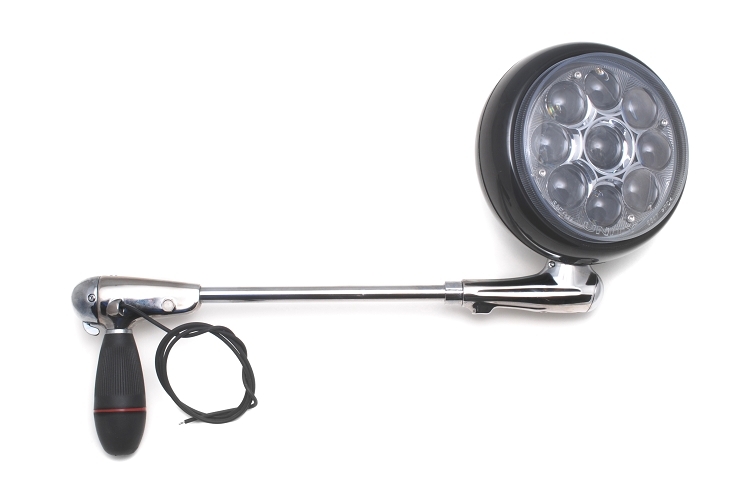 The lamp has a hard-coated, polycarbonate, sealed lens and aa anodized aluminum die cast reflector. The 335 series feature a head assembly made of high impact PC/ABS with black finish. They are designed to compliment both modern and classic vehicles, and provide long service life. Installation kits are sold separately and include mounting bracket, fasteners, gasket, drill guide, trim pieces, locating template and complete instructions for do-it-yourself installation. To determine the correct part numbers for your vehicle, select the SEARCH link in the horizontal navigation bar on out home page and the select APPLICATION SEARCH.